Around 1,500,000 customers fly with NetFlights from the UK every year. With low-cost flight options available for Australia, the USA, Thailand, Canada, India, Japan, New Zealand, the UAE and many more countries, NetFlights is the number one place to go to compare flight prices in order to find the best deal. Explore major cities all over the world including New York, Dubai, Orlando, Bangkok, Bali, Tokyo, Las Vegas and Sydney with NetFlights and even discover low-cost hotels and car hire in each destination too. NetFlights promise to never compromise on quality in order to bring you the best prices. You can travel in complete confidence with NetFlights knowing that you’re safe in the hands of huge airlines like Emirates, American Airlines, Air New Zealand, British Airways, Qantas and Qatar Airways. And, when you book with NetFlights you can rest assured with the knowledge that your holiday is ATOL protected, with Which? 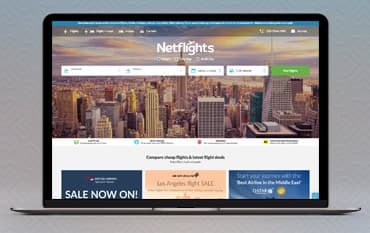 even rating them the ‘Best Comparison Site for Booking Flights’ alongside great reviews from names like Lonely Planet, Forbes and the Evening Standard. If you’re looking to book your next getaway in an easy and hassle-free way book your flights and hotel with NetFlights. Whether you’re looking for a cheap and cheerful break or luxury holiday, they have a package to suit you, your needs and your budget. Discover flight and hotel deals for some of the most popular locations around the world including Orlando, Dubai, the Caribbean, Sri Lanka, the Maldives, Cuba, Africa, plus many more. You can also find great package deals to places like Disney World Resort, with attraction tickets and holiday extras also available to purchase through NetFlights. If you require car hire for your holiday, book through NetFlights with your flights and hotel to make things quicker and easier for you and your travel companions. With NetFlights you can discover car hire in some of the most visited destinations around the world including the USA, Australia, Europe, South Africa, Canada and New Zealand. Enjoy great flexibility and choose from over 8,500 pick-up locations around the world and benefit from free cancellation 48 hours before your collection, if you happen to change your mind. The straightforward and clear online booking system at NetFlights also makes choosing the right car really simple, with no hidden costs and full protection if anything should happen to your rental car. How can I contact NetFlights? Should you wish to cancel your booking please contact the NetFlights customer service team who will be able to advise you accordingly. For online bookings please call 01772 386366. I am unable to travel, can someone else take my place? Unfortunately, complete name changes to airline tickets are not possible. The existing ticket held would be subject to any potential cancellation charges, and a new ticket would need to be purchased for the new passenger. NetFlights have been comparing flights online since 1995. Every day they search thousands of routes and compare hundreds of airlines to find the cheapest flights for you. Whether you want a multi-city flight or a direct deal, the flight finder technology at NetFlights tracks down the lowest airfares for free and lets you compare your options. As well as comparing budget-friendly flights around the world, NetFlights also search for cheap holidays and low-cost car hire, allowing you to make your whole holiday affordable. And, to save even more on your getaway you can also book your flights, hotels and car hire using a voucher code from us. We are constantly on the hunt for Discount Codes for NetFlights to help you with your money saving. Our experts check dozens of sites for secret codes including NHS discounts, student sites & social media channels saving you time & money!